Ahhhh sweet summer nights, sipping Pina Colada’s on a beach front somewhere wonderful… all just a dream for this heavily pregnant mother of a toddler! Doesn’t mean I can’t bake some super tasty muffins! Because cocktails and muffins totally compare. Excuse me while I go sob in the corner for a moment…. Rightio! Back again! This pregnant mumma is also living in the icy start of winter, where our pipes are already starting to freeze in the mornings and our windscreens need to be scraped of ice before driving anywhere. So sure, why not tropicana on your tastebuds! Liven things up! 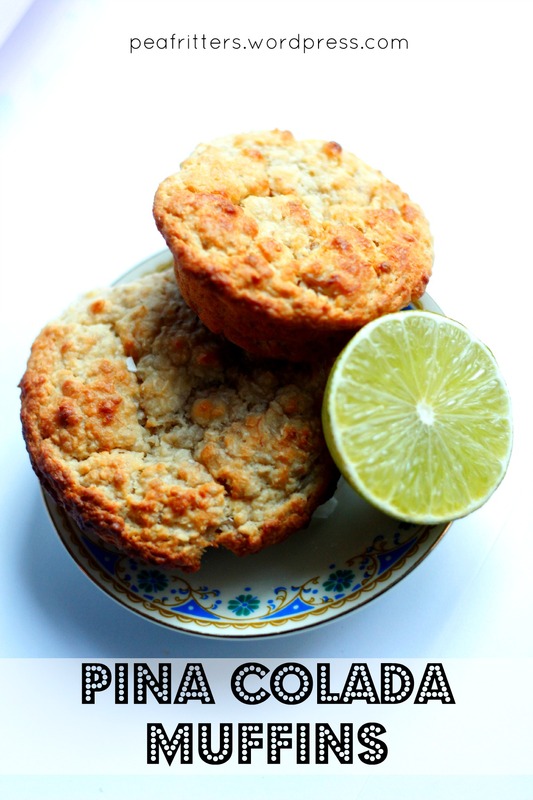 These Pina Colada Muffins are a delicious combination of some of my favourite things. Lime. Sweet, sweet (or sour) lime. Plus a few other healthy yummos like chia seeds, yoghurt and banana to make these Pina Colada Muffins totally guilt free. They are both egg free and nut free making them perfect for school lunches and toddler afternoon teas. And with only 2 Tbsp of coconut sugar added you can confidently even give these as a little baby led weaning treat too! These Pina Colada Muffins are quite a moist mix so when baking make sure to give them a little skewer test to check if they are done. I had to keep putting them back in the first round, I think I was a bit too excited to try them! 2. Meanwhile, preheat the oven to 200°C and grease a mini muffin pan. 3. 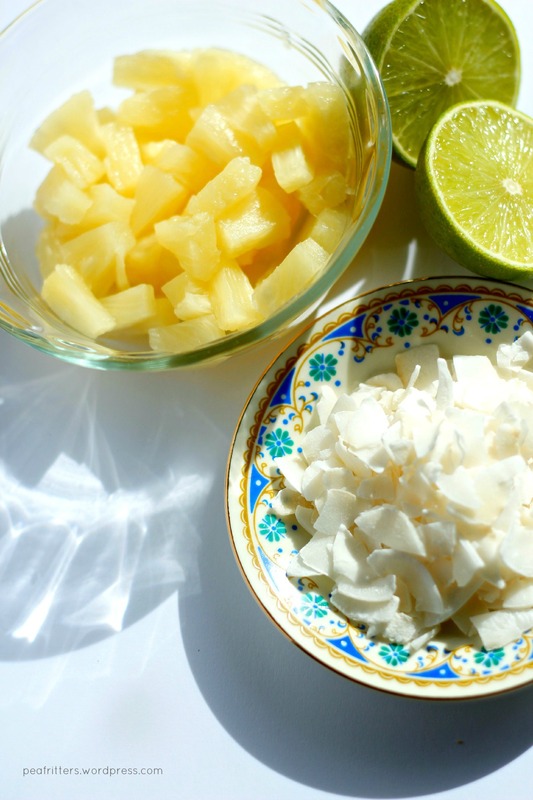 Combine desiccated coconut, SR flour, baking powder, coconut sugar and lime zest in a large mixing bowl. 4. 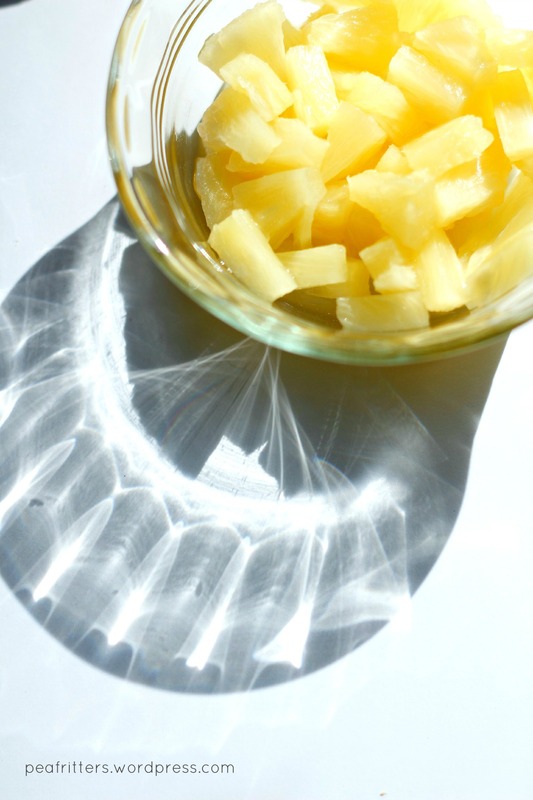 Mash bananas and stir through pineapple pieces. 5. 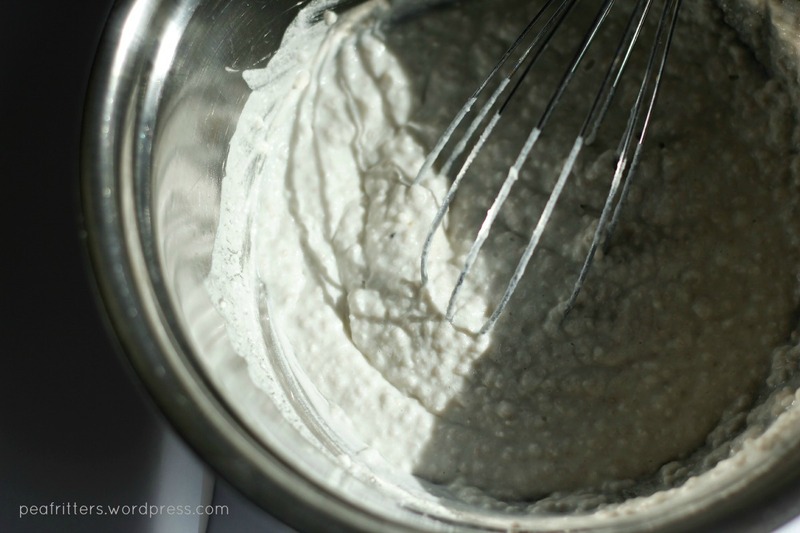 Whisk together coconut cream and the chia seed mixture. 6. Combine chia/coconut mix, pineapple/banana mix, dry mix and yoghurt. 7. Spoon into muffin pan and bake for 20-25 minutes, check with a skewer that they are cooked right through as this is quite a moist mixture. I had to add in this photo of the pineapple pieces. The sunshine through the bowl was making such beautiful patterns. And that photo of the whisk is actually a colour photo, looks black and white. Pretty groovy 🙂 I hope these Pina Colada Muffins add some tropical sunshine to your day! Enjoy! 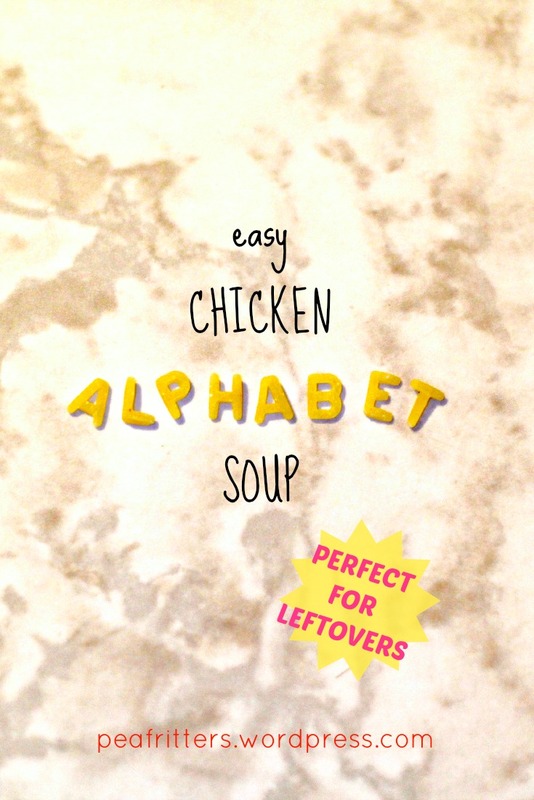 This Easy Chicken Alphabet Soup is the perfect way to use up leftover roast chicken. A nice bonus when you’re using meal planning is this 2 for 1 kind of cooking! Less fuss, less stress and less cost. Bingo! And yes I did have just a bit of fun picking out the letters to spell “alphabet” for my nice pic up the top 🙂 You likey? I used a Lego keyring (guess who owns that one!) as my lighting. So fancy! So professional! As a little side story, it’s funny how sometimes the universe knows things way before you do. I cooked this soup on Saturday night. I did the grocery shopping during Saturday day, I normally do it Monday. I also strangely had the house pretty darn clean and organised by the time I went to bed that night. Plus Possum hadn’t had any Mummy Milk for 3 days… That night I was rushed to hospital with bleeding. I am 30 weeks pregnant and have placenta praevia. Legoman was out bush and out of phone reception. Not a fun situation. To cut a long story short, I am now home again after a couple of nights in hospital. Both baby and I are absolutely fine. I was joking that had the hospital had a kitchen, a DSLR and wifi I could’ve happily blogged whilst there! Instead I used up all my data on my phone reading everyone else’s blogs (I found a few new ones here and here)! 1. 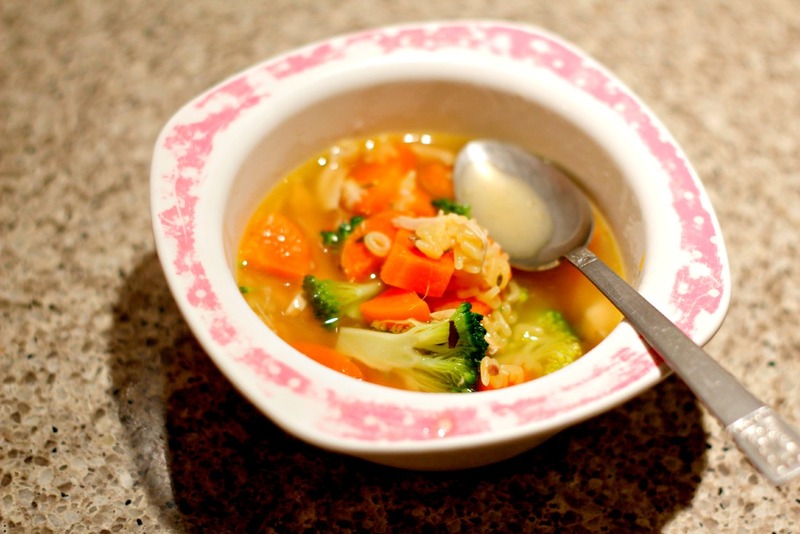 Place all ingredients for the broth into a slow cooker. Cook on high for 4-5 hours or low for 10-11 hours. Or do as I did and start it on high for a few hours while you go do the grocery shopping then turn in to low until close to dinner time. 2. 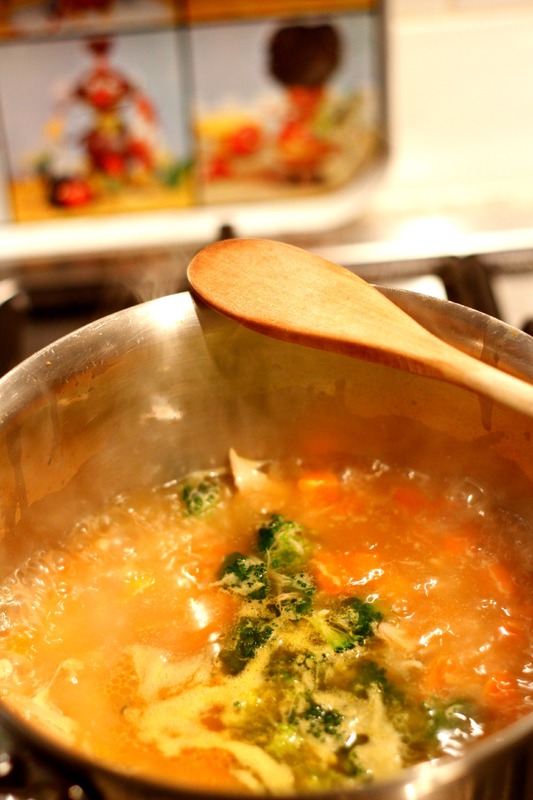 After cooking the broth, strain it through a pasta strainer. Strip chicken carcass of as much meat as you can. I still had nearly half a chicken on my leftovers so this was quite a meaty soup. 3. 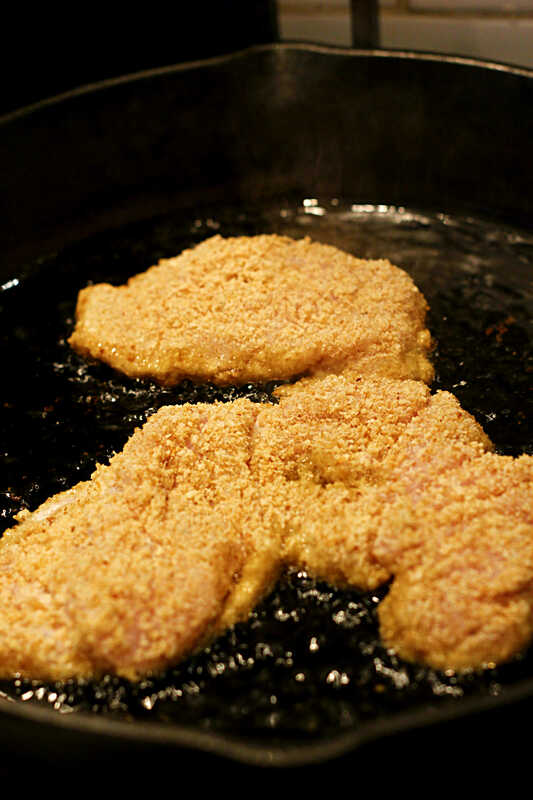 Add the strained broth and chicken meat to a large saucepan over medium-high heat. 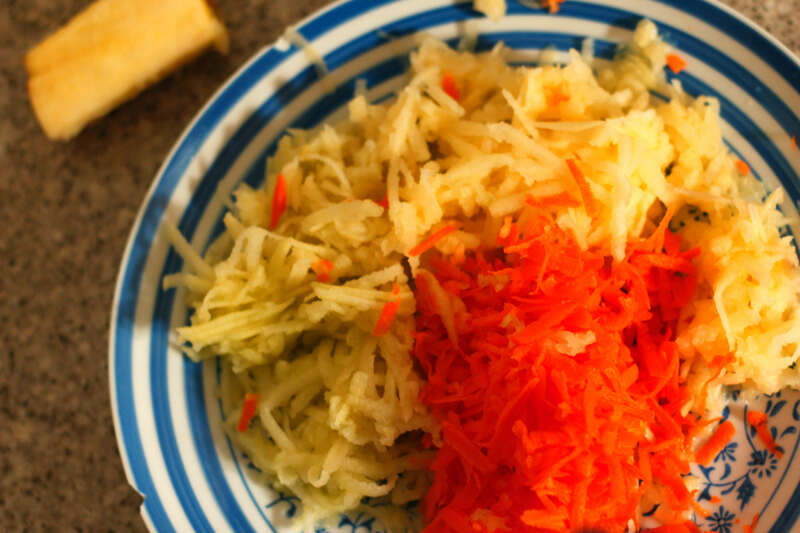 Add your sliced carrots. Cook for 2-3 minutes. Then add your alphabet pasta and broccoli. Cook for 5 minutes. 4. Then serve! It’s really that crazy simple!! If you don’t have a slow cooker you can easily make the broth by sitting all the ingredients in a large saucepan on very low heat on the stove top. You could reduce the cooking time this way too. I could’ve tried to style this soup, but really it’s such a kiddie classic and nostalgic wonder, I just had to put a picture of Possum’s cute little pink bowl and teaspoon instead. 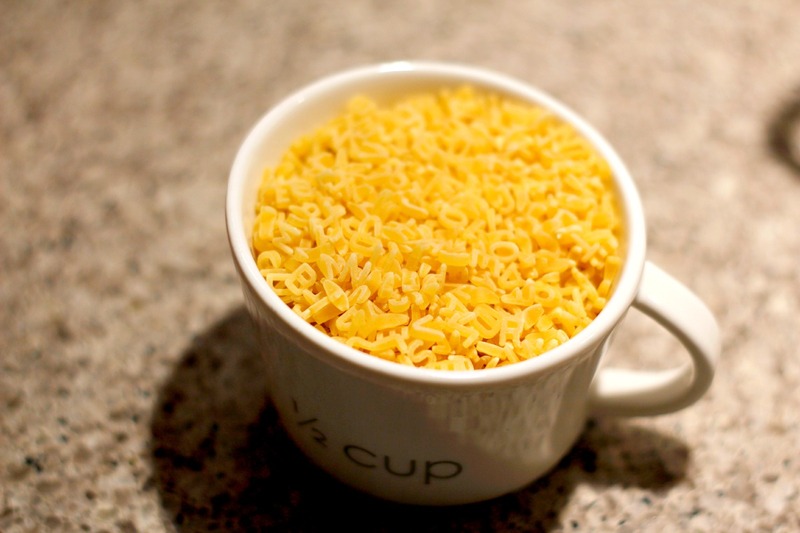 I hope your family enjoys this Easy Chicken Noodle Soup! Everybody loves a good homemade roast chicken! 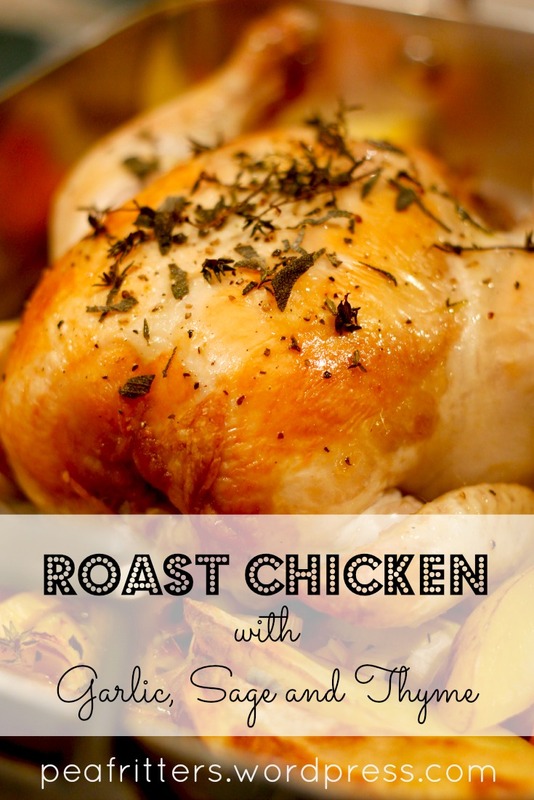 Well maybe the vegans and vegetarians don’t… but everyone else loves a homemade roast chicken! 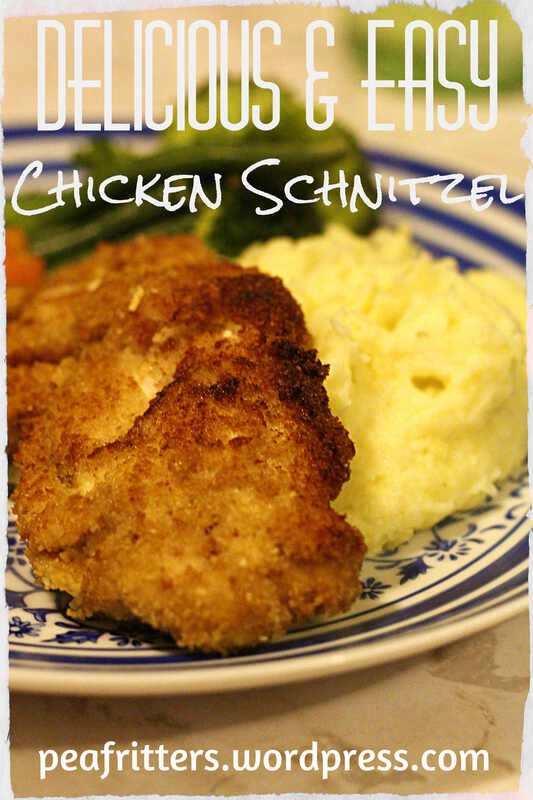 I love the simplicity, ease and minimal cost that comes with such a delicious and soul satisfying meal. I also love that my whole family enjoys sitting down and sharing a lovely roast chicken. 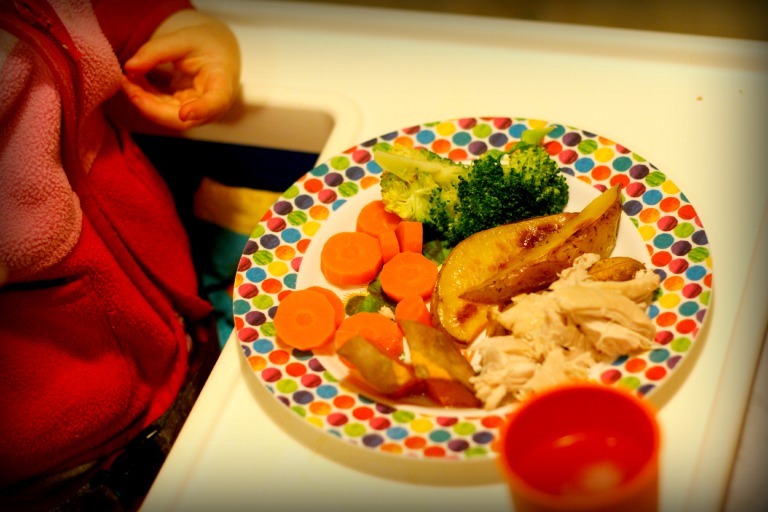 It makes an ideal toddler dinner and is wonderful for baby led weaning too. My Roast Chicken with Garlic, Sage and Thyme was just what the doctor ordered today after a day at work, a toddler who hadn’t slept, plus minimal supplies in the fridge and pantry. Hello trusty garlic and home grown herbs! A few minutes chopping and prepping and you will have a wonderful meal in the oven. You can then spend the next hour that it’s cooking catching your breath, enjoying a hot cup of tea (put Play School on, seriously) or getting some odd jobs done (that cup of tea is looking mighty fine). freezable sandwiches for work and school lunches. Simply put chicken and mayonnaise on a sandwich, wrap in Cling Wrap then freeze. On the day you want one, take it out and let thaw in your bag. By lunch it will be perfect! 2. Slice your leek and rinse in a colander under running water. This is very important as the many layers of a leek hide a lot of dirt and grit. Place sliced leek in a large roasting pan. 3. Rinse and pat dry the chicken. Place chicken on top of the sliced leek. 4. Place desired number of garlic cloves in the cavity and you can also pierce the flesh and push the bulbs into the chicken itself. I also like to cut one clove in half and rub it over the skin. 5. Place your chopped vegetables around the chicken. 6. Drizzle both chicken and vegetables with olive oil and season with salt and pepper. Place herbs over the top of the chicken. 7. Place roasting pan in the oven to roast for 25 minutes per 500g of chicken. I had a 1.4kg chicken and roasting for 1h 15 minutes. 8. Now for the hot tip… When you take the chicken out of the oven, place it upside down either in the pan or on a plate to rest, covered in foil. 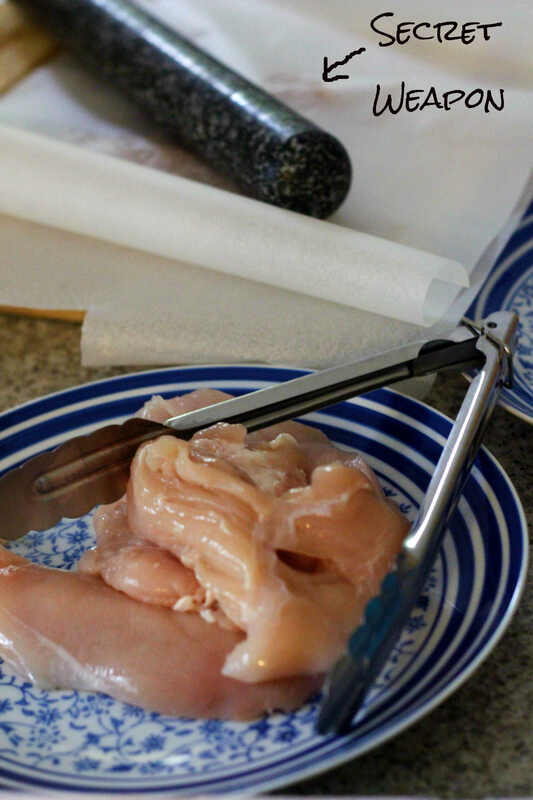 This allows all the lovely juices to run back into the chicken breasts and keep them lovely and moist. Allow to rest for 10 minutes before serving up. 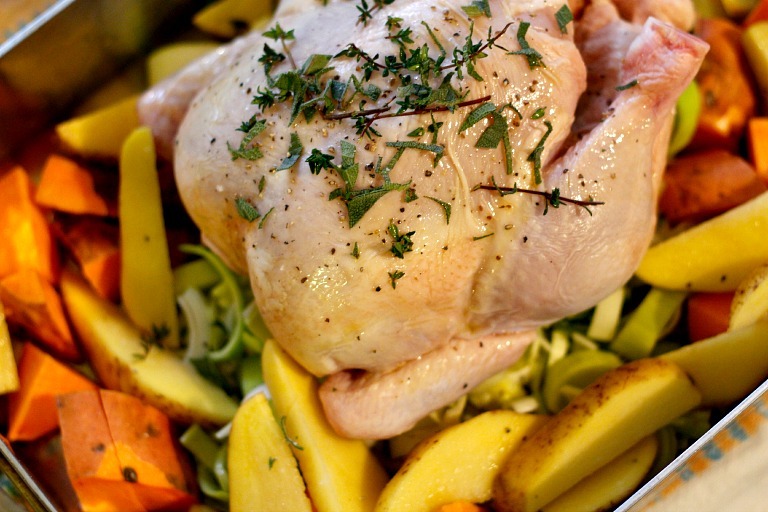 Serve your delicious Roast Chicken with Garlic, Sage and Thyme with the roasted potatoes, sweet potatoes and some steamed vegetables (Possum loves her carrots and broccoli). Nom nom nom. ***Want something delicious for dessert? 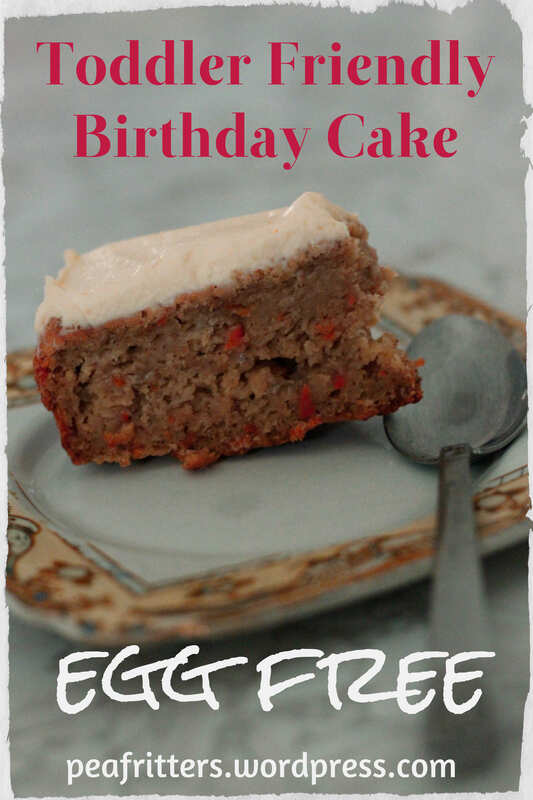 Check out my Egg Free Spiced Pear Cake. ***Come like my Facebook page and join in the fun! Lots of posts about food and family. Last night Legoman and I tackled the totally un-fun task of clearing out one of our food cupboards. This meant pulling everything out of the cupboard, checking used by dates and ingredients, and then either throwing out, giving away or putting it back in the cupboard. We hadn’t really done that since Possum was diagnosed with her allergies. Or since I started meal planning. And coming from a long line of hoarders, turns out we could have survived some kind of apocalyptic event just on the amount of almond meal I have stashed away…. So these delicious Carob Almond Poppy Biscuits were a result of all the wonderful things I rediscovered hiding in my cupboard! 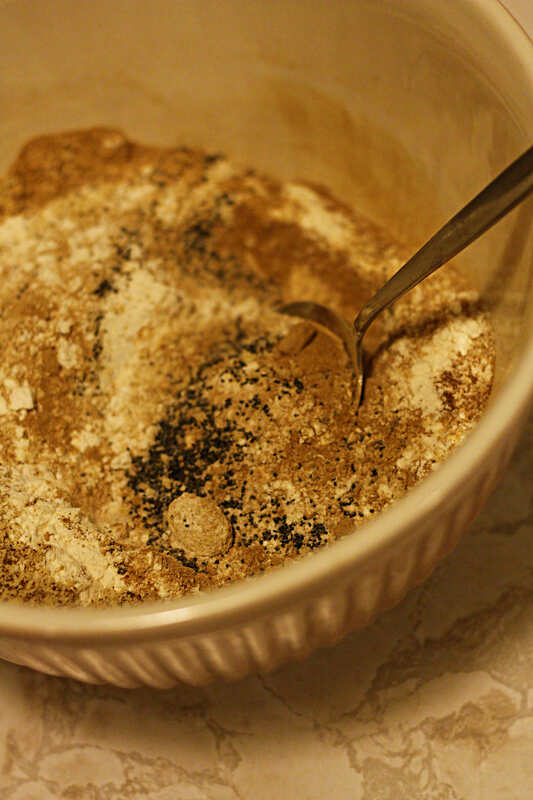 I found Carob Powder left over from doing the elimination diet with Possum, almond meal (lots of almond meal), poppy seeds and an awful lot of self raising flour. Quite often when you mention carob people screw their faces up and remember the waxy little carob buds sold at school canteen’s across Australia in the 80s and 90s. But I have found the most delicious Australian made carob and it’s an absolute winner! I’m not paid to say how tasty it is (they don’t even know I exist! 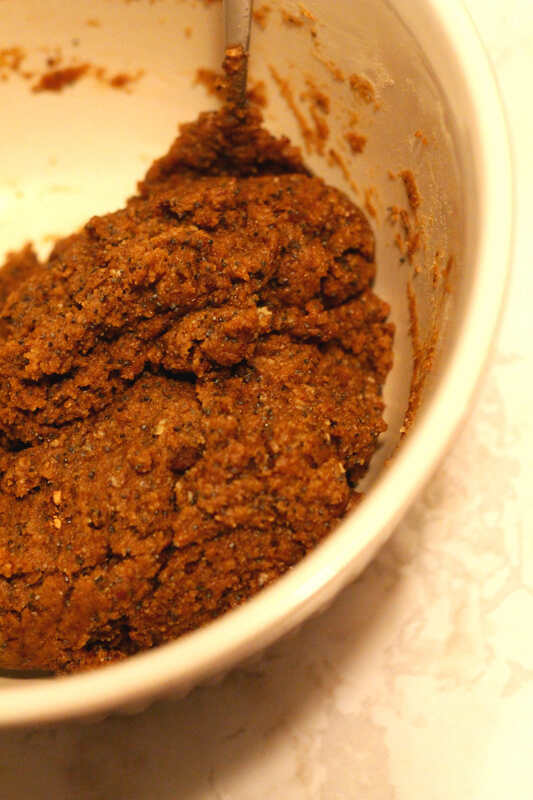 ), but The Carob Kitchen’s carob products are to die for. Especially their Carob Almond Bar and their little Banjo Bars (which I often scoff after doing the grocery shopping! ).Why carob? 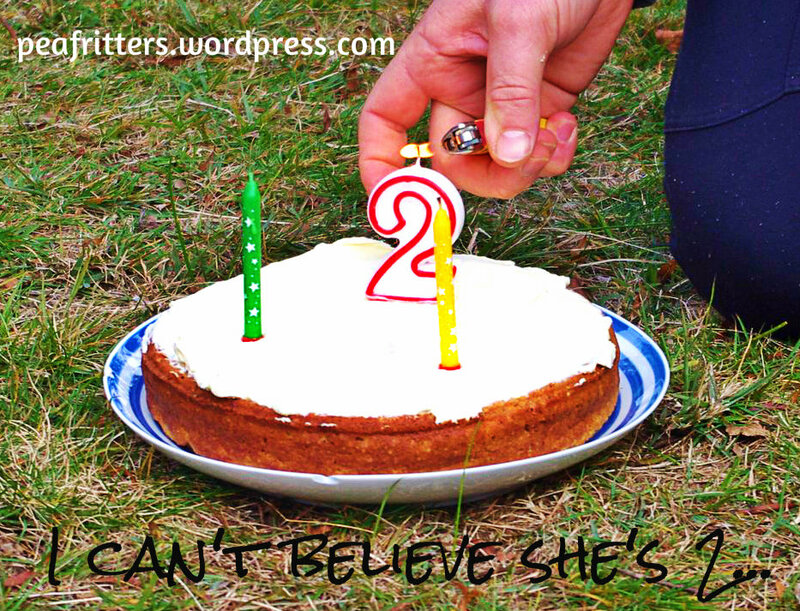 It’s gluten free, caffeine free (hello pregnancy and breastfeeding!) plus their bars have no added sugar or sweeteners as the carob is sweet enough. Winner! 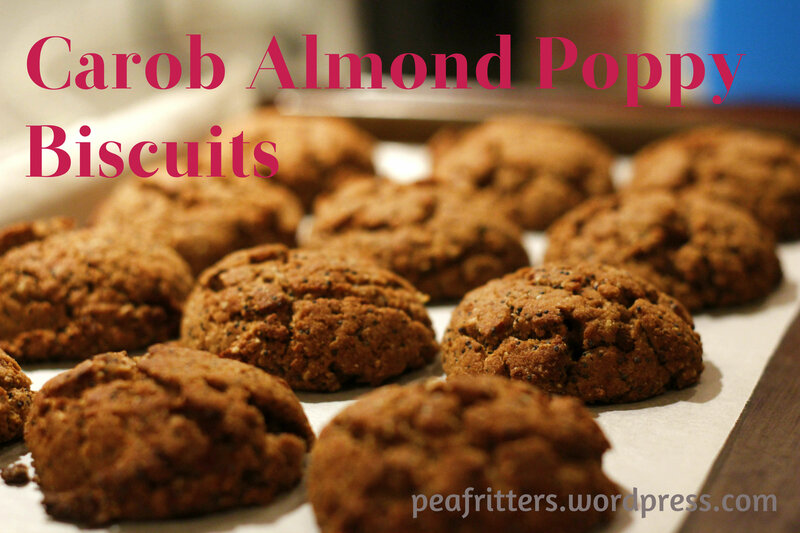 I love the texture the Poppy Seeds add to these Carob Almond Poppy Biscuits. Little bursts of POP when you bite in. Yum! 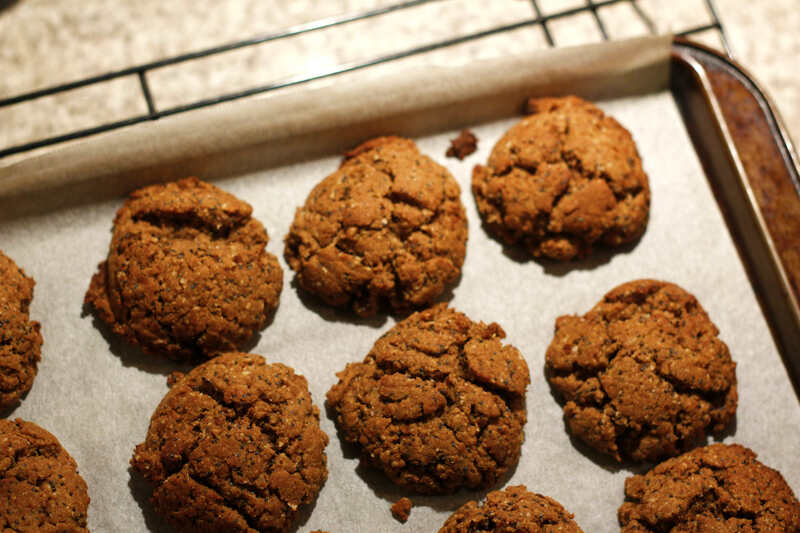 The little bit of cinnamon adds just a hint of spice and the combo of almond and butter gives them a certain richness. So go clear out your cupboards! Who knows what you might find in there! Preheat oven to 220°C conventional/200°C fan forced. Line a baking tray with baking paper. 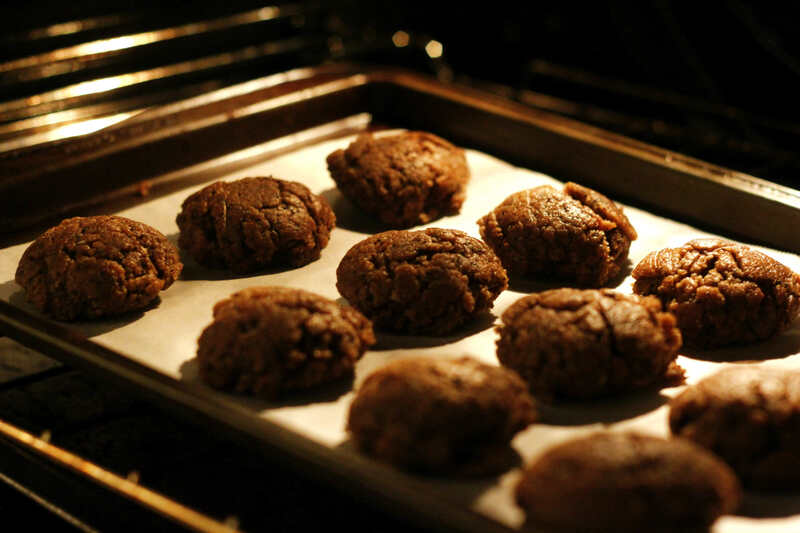 Mix together flour, carob, almond, poppy seeds, cinnamon, and raw sugar. 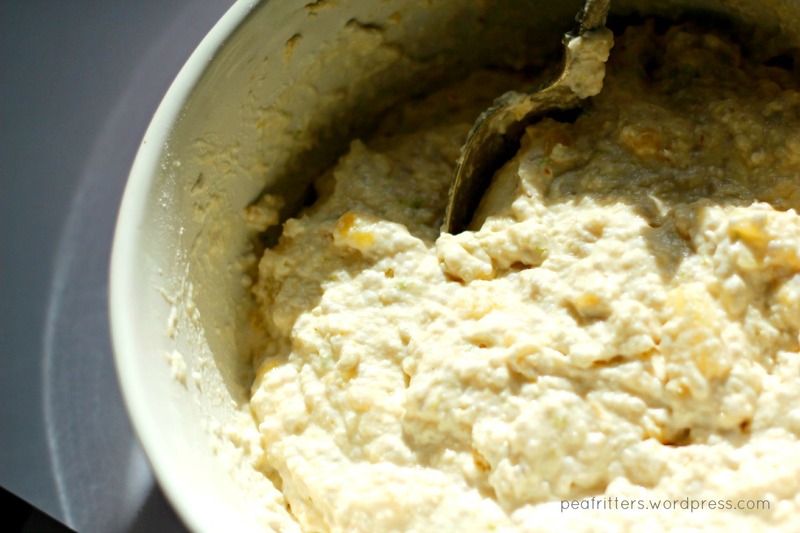 Meanwhile mix together your No Egg or whisk your egg. Melt the butter over a low heat then add the vanilla and maple syrup. Swish to combine. Make a well in centre on mixing bowl. First add your No Egg mix or egg, then add your melted butter mix. Stir until just combined. Spoon mix onto baking tray. Bake in oven for 13 minutes. Allow to cool slightly before gobbling them all up! Looking for more Egg Free Recipes? Interested in Meal Planning? Print out my free Meal Planning Printable Template! Like Pea Fritters on Facebook to be kept in the loop with all things food, family and fun. After Mother’s Day on Sunday you may have some roast pumpkin swimming around in your fridge. Or maybe you totally forgot Mother’s Day and are looking for a way to make it up to the person who gave you life! 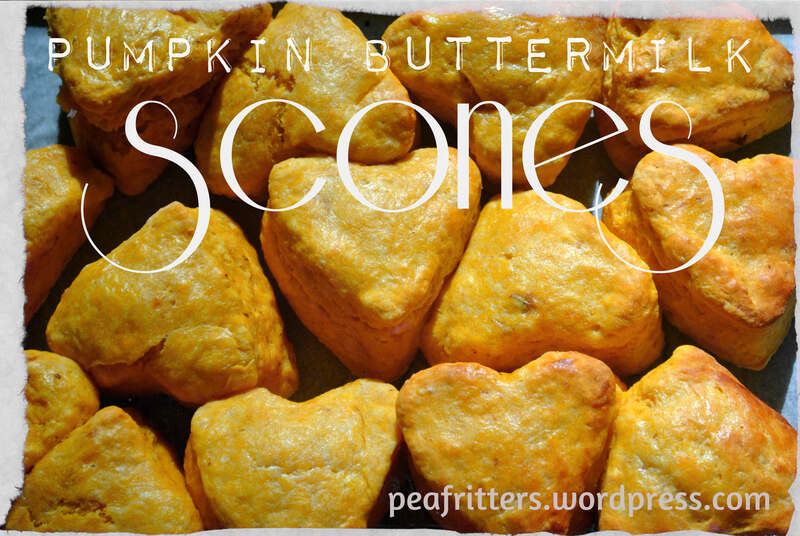 Either way, these Pumpkin Buttermilk Scones are delicious! Mother’s Day was a bit of a non event in our house. Legoman went to work and Possum and I went to a birthday party. I did get to stay in bed an extra 30 minutes and we had croissants for breakfast. Win! Possum gave me a very sweet book called I Love You Mummy and Legoman gave me/us welding gloves, a small shovel and a metal bucket. Romance hey! The romantic thing is that they are all used with our fire place, and they have already been put to good use. The scones were made for the birthday party Possum and I went to, which was a combined 2nd birthday party for Possum and a few of her little buddies. We had such an amazing afternoon on a friend’s property in the Kanimbla Valley. Amazing views, a beautiful large creek, heaps of space for happy toddlers plus we even all chipped in and got a jumping castle. Needless to say poor Possum was beyond tired by the time we got home. And the scones were a success! These Pumpkin Buttermilk Scones are great for kids as they are low in sugar and actually have some veg in them. If you like you could play around with the buttermilk and pumpkin ratios if you want more pumpkin in there. Possum and I just had to do some quality control when they came out of the oven! Yummo! Preheat oven to 220°C standard/200°C fan forced. Line a baking tray with baking paper. Add flour, nutmeg, sugar and salt into a large mixing bowl. Combine. Using your hands, rub the butter into the flour until the mix resembles fine bread crumbs (I used to love doing this as a kid growing up). Make a well into the centre of mix. Add buttermilk and pumpkin. Use a butter knife to combine until it forms a sticky dough. Turn out onto a floured surface (also put a little flour on your hands). Knead gently until smooth. Press out the dough until ~2cm thick. You can either cut into desired number of scones or use a cutter to make shapes (I did love hearts, surprise surprise!). Place the scones on the baking tray so that they are just touching. Brush the tops with some buttermilk. Bake in the top half of the oven for 12-15 minutes or until golden. Serve with butter, ricotta or even mascarpone for a special touch of yum!